Nashville & the gorgeous lake! Perfect location with spectacular views!!! GORGEOUS home on Old Hickory Lake. I have been told by many people that my dream home has the most beautiful of all views on Old Hickory Lake. Re-furnished with rustic/chic charm. Dock available for one time fee. Short drive from downtown Nashville, and close to just about everything. It is truly an extraordinary property with 6 levels of deck overlooking the expansive lake. Can accommodate 10 but I prefer 8 at the most for people that are picky about inflatable beds. It has everything for comfort. Great for romance, and amazing family and friends get away! It is a large house about 3,000 square feet. There are 3 bedrooms, each with a KING, and two QUEENS. I also have one large Frontgate King Inflatable bed that can be set up anywhere and are high off the ground like a real bed - very comfortable-high end. A queen wood quality inflatable. Also have two Twin XL trifold sleepers that can be used in any room. I am a mom to my two amazing children and to my dogs! I am a NJ native and have been raising my children who are in/off to college. I have lived quite a few places over the years and am ready for the back half of my life.Beckoned to Nashville area for some reason. It may be the music! Or the amazing foodie places, and the friendly people. But mostly, for my beautiful home on the lake. I want to share it with guests for a memorable time. It really is a unique and ideal setting and beautiful home. As soon as my daughter and I walked in we were WOWED! It was serendipitous. And I bought it from two amazing people who sing and have written songs here. A true GEM. If you wash a full load, please only dry small bunches in dryer at a time. Keeping up with your towels is always appreciated. keep loads small in order to dry. Also put it on time dry for 40 minutes. 3 of them. PLEASE BE EXTREMELY CAREFUL WITH THE GAS FIREPLACE. CHILDREN SHOULD NOT BE UNATTENDED. I have a Chemex with filters. It is the most delicious coffee (provided). For those of you not confident in your coffee skills I also have a french press and a cuisinart coffeemaker. Spectacular lake and trees - what more can you ask for? 6 levels of deck landings including a screened in deck with hardwood floors and fans. There are many golf courses in this immediate area. Randi was awesome!!! We got to Nashville early and let us enter the rental before the rental time. He was also very quick at replying when messaging him, and very attentive if we needed anything while we were there. Beautiful views walking into the house! We enjoyed our stay for sure and hoping to visit soon again! This house was even more perfect than we expected. I came to town for my sister's bachelorette party, since she lives in Nashville she wanted something that felt like a getaway. This house was beautiful and quiet, and perfect for a weekend with friends. We also made the drive to and from Nashville a few times with no problem. It's very easy to get an uber from the house. We lounged in the comfy beanbag chairs all weekend, and we had a catered dinner that made use of the fully stocked kitchen. Randi was very communicative and helpful. Thanks for a great weekend in your beautiful lake house! Aly- you’re all so great- you took great care of my home and just lovely girls. I truly appreciate a communicative guest so thank you! I hope you come back again! Congratulations to your sister and wish you all happiness. This house was the perfect destination for our group of 7, and we could have very comfortably stayed here with a larger group. 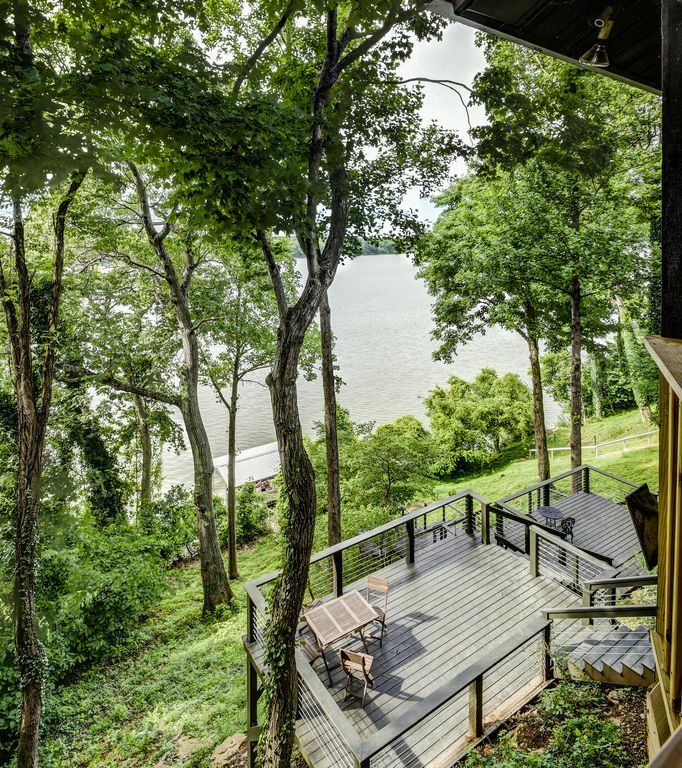 The house is roomy with plenty of space for sleeping and entertaining, and the view of the river is simply fantastic. It is located closely enough to Nashville to make a night on the town no problem, but you’ll want to spend plenty of time at the house too! Randi was so helpful throughout, and checked in a couple times to make sure everything went smoothly. We highly recommend this property and it will be top of mind if we come back to Nashville! Thanks so much for the kind words. You and your group were wonderfully communicative and just plain old nice!!! Please come stay again!!!! Went to Nashville for a girl's weekend. This house was perfect! Beautiful view and lots of room to relax. Tina- thank you so much for taking great care of my house. My cleaning people complimented you and that’s rare😂! Please come back anytime! Great views & perfect for a larger group! We stayed here with a group of 10 girls and it was very comfortable. The views were beautiful and the home had plenty of space for our large party. Randi was great and super helpful and always available. I would recommend a new cleaning crew though as they left the home a bit dirty and unorganized. Found some dirty towels shoved in a closet, dirty bathroom rugs, garbage bags and toilet paper were missing & a few other things. Everything that a good cleaning crew would be able to remedy so no reflection on the house itself as it was beautiful and very spacious. Nicole, thank you for the feedback. The cleanliness of my home is of the utmost importance. I have a wonderful cleaning crew but every now and again some things can go to the wayside. Please come back again! Beautiful Home right on the lake! Just a great experience. The owner was so helpful and accommodating! Beautiful area right outside of Nashville! :) Thank you! Thanks- you are awesome guests! It was such a pleasure with every communication and I’m so happy you lived your stay! Please be my guests again! Close to Nashville but in the NW about 15 miles to Gorgeous Old Hickory Lake which is booming with vacationers for the water sports and fishing! Has it all! Close to Opryland too. Great spot for EVERYTHING you want.